What: 3 x 1 hour fully subsidised coaching sessions with an accredited coach. When: Coaching sessions will start in September 2018 and take place over 3-6 months. It is for you and your coach to decide when each session takes place. 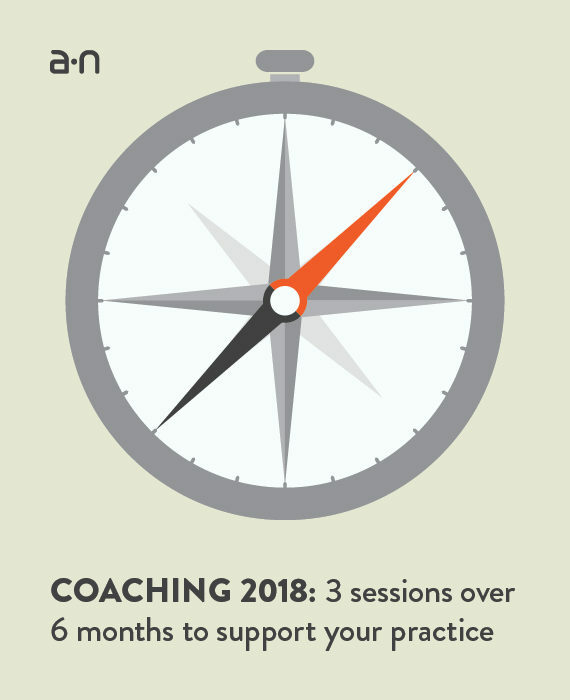 The a-n Coaching programme is a new strand of professional development support for a-n members. Since 2016, a-n has trained 20 Artist and Arts Organiser members as accredited coaches through our Visual Arts Coaching Course in partnership with RD1st. We are now working with these accredited coaches to offer the benefits of coaching to the wider a-n membership. Coaching sessions are offered remotely, with contact either by phone or video call, making sessions flexible and accessible. Each of the 3 sessions will last 1 hour and will be undertaken over 3-6 months. Coaching provides a safe, confidential, developmental space within which to explore specific issues (either known, or as they arise), aspirations and challenges. Coaching concentrates on where we are now and what we are willing to do to get to where we want to be in the future. This process is supported by the coach’s interventions, support and application of the coaching process. In each session, the participant identifies the focus of conversation, while the coach listens, reflects and questions. Coaches will not evaluate, judge, offer unsolicited advice or set targets for you. Your coach trusts that you are your own best resource. Coaching can help bring vital support to those seeking change, a shift in gear and renewed focus. All a-n coaches work within the visual arts sector and are trained and accredited by Relational Dynamics 1st through a-n’s Visual Arts Coaching Course. While undertaking coaching can be valuable at any stage of your professional development, coaching may be better suited if you are further along in your career to support you in developing insight, strategies, and enhanced performance around specific tasks or behaviours. If you are able to identify specific needs you want to explore in depth, this is a good starting point for coaching. If you feel you are at the stage of needing knowledge and advice, then mentoring may be more appropriate (see below). In addition to a-n Coaching, we are also offering a year-long a-n Mentoring 2018 programme which is also open for applications from a-n Artist members, Joint (Artist and Arts Organiser) members, and Arts Organiser members. Mentoring and coaching are sometimes discussed as though they are interchangeable, but this isn’t the case. To help understand which might be the best fit for you, find out more about the benefits and differences between mentoring and coaching in a-n’s Resource guide Coaching or mentoring: which is right for you? Only current Artist, Joint (Artist and Arts Organiser) and Arts Organiser members can apply. The form is available until 11am, Monday 23 July 2018. A short statement about your artistic practice (up to 150 words). The impact coaching will have on the applicant’s practice and continuing professional development. The need for support. Is this the right time for the applicant to benefit significantly from coaching? Does the applicant have clear goals for the coaching programme? 3. Why does a-n offer coaching? Applications from members who have accepted an a-n Artist Bursary 2018, a-n Biennial Bursary 2018, or a place on the a-n Visual Arts Coaching Course in 2016, 2017 or 2018. Any joint or collective applications, coaching applications should only be for one individual applicant. a-n cannot respond to requests for advice in shaping applications. Accepting an offer of mentoring comes with the obligation to commit to three x 1 hour sessions during the programme. a-n will share guidance for coaches and coachees to all successful applicants to clarify expectations and boundaries for the sessions. Members will only be able to accept one a-n member opportunity each in 2018.
a-n Mentoring 2018: apply for one of twenty-five places to remotely access a series of mentoring sessions with one of 5 visual arts mentors.